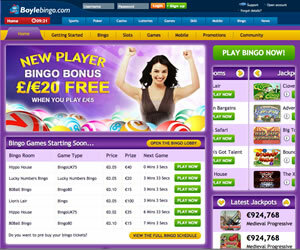 Boyle Bingo is owned and run by Boylesports, the largest independent bookmaker in Ireland. The site is powered by the popular Virtue Fusion software and is part of the Virtue Fusion network. The home page is nicely designed with a purple and orange colour scheme and a selection of scrolling banners advertising their welcome offers and latest promotions. 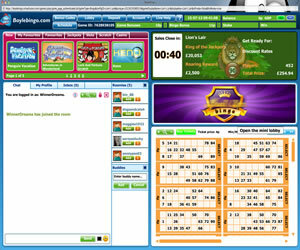 At the top of the page you will actually find two menus, a blue one which links to all of the other areas of the Boylesports online operation (such as sports, poke and casino) and an orange one that is specific to the bingo site. Click on the small green 'Join Now' button and you will be asked for your basic details such as name, address, username and password. If you already have an account with any of the other sites on the Virtue Fusion network, you may need to come up with a new username before your accepted. Once you have done this, you will be automatically taken to the banking page, and there are plenty of different ways to fund your account including credit cards, debit cards and the majority of the secure online payment methods. Boyle Bingo will welcome you with a small bonus but only after you deposited and played through your first £5. The first time you enter the Boyle Bingo lobby, you will be asked to come up with a chat name, and this must be different to your registered username. Here you will find a selection of tabs leading to all of the different games on offer including 75 ball bingo, 80 ball bingo, 90 ball bingo, slots and multiplayer slots. There are plenty of different rooms to choose from, and you can easily decide where is best to play thanks to the extra information given, such as the prize, the price of the tickets and the number of people playing. You can also bring a full schedule of all future games, which gives you the option to pre-purchase your cards and join in the fun, even if you can't get online to play live. All of the Boyle Bingo rooms have a different themes, with names such as The Bingo Games, Britain's Got Talent and Hippo House. No matter which room you enter, you will be guaranteed a warm welcome from the Chat Hosts who are there to make sure everything runs smoothly, provide support and run chat games where you can win extra bonus money. The rooms themselves are well laid out with half of the screen dedicated to the chat room, and the other half displaying your cards. There are a few options to customise the look of the game but you could easily miss them as they are hidden in 'Tools' sub menu when you click on 'Account' at the top of the screen. 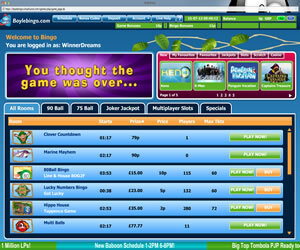 Boyle Bingo has a fair number of promotions but they are all based around guaranteed jackpot games. If you are looking for prize bingo or anything really special, you are better off trying one of the standalone sites, as they have more scope to offer something a little different. If however you like your free bingo and big cash jackpots, you will plenty to keep you occupied, but just remember you are playing against everyone else on the network, so your odds of winning are reduced. Boyle Bingo has a lot to offer both old and new players alike, with plenty of games and promotions to keep you occupied. The small welcome bonus and lack of reloads will put off the free money hunters, but the less bonus you receive, the less you need to wager before you can withdraw any winnings, so it's not all bad. Add to this the ability to use your log in details on all of the other Boylesports sites, and you are left with an online bingo site with a lot more to offer then the rest of the network. If you like Virtue Fusion, then Boyle Bingo could be the site for you. Boyle Bingo offers a wide selection of bingo games from pattern, multi-line and multi-part 75 ball games and the traditionally English 90 ball games. Additionally you will find themed games like Deal or No Deal Bingo and Lucky Numbers Bingo. The wagering requirements are 3x the bonus funds received for the bingo bonus or 20x if you opt for the slots bonus.